The 31.4 metre motor yacht My Way, listed for sale by Joost Goverts at Northrop & Johnson, has been sold with Eliad Hagiladi at Yacht Marine introducing the buyer. Designed by Frank Mulder, she was built in GRP by Cheoy Lee to ABS class and delivered in 2002. This superyacht’s Dee Robinson interior uses warm cherry wood cabinetry accented by walnut burl and black lacquer throughout. The joinery is Beidermeyer styled cherry wood and maintained in a rich, rubbed satin finish. Accommodation is for eight guests in four cabins consisting of a master suite, two doubles and a twin, all with entertainment centres, television screens and en-suite bathroom facilities. In addition, four crew are accommodated in two en-suite cabins. Glass sliding doors open into the main saloon seating area, which features a plush upholstered L-shaped sofa and occasional chairs surrounding a designer cocktail table along with a wet bar and fridge. To the aft starboard corner is the entertainment centre including a Pioneer 45-inch plasma television while cabinetry follows forward up the entire length of the saloon past the dining area with seating for eight guests. The fully equipped galley forward has a country style kitchen including a dinette and couch for casual breakfasts and daytime snacks. Up in the pilothouse, a raised L-shaped, upholstered settee surrounds a cherry wood inlaid cocktail table, wooden bookcase & writing desk, and also a Sharp Aquos 17-inch flatscreen television. 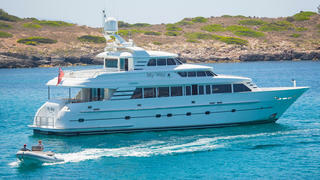 Twin 1,800 MTU diesel engines power her to a top speed of 21 knots. Currently en route to Spain, My Way was asking €1,395,000.